The Consumer Financial Protection Bureau (CFPB) and the Federal Trade Commission (FTC) have released their joint annual report on the Fair Debt Collection Practices Act (FDCPA). It’s something that debt collection industry stakeholders generally monitor for insight into industry trends. This year’s report confirms the clear trend of rising delinquencies. While still at historically low levels, this very clear upward trend should be prompting prudent risk officers and lenders to take notice and begin to prioritize credit risk mitigation strategies and action plans. We believe that these delinquency characteristics will create real pressure on lenders as early as 2020 and certainly by 2021. The substantial increase in consumer lending since the deeply painful financial recession of 2008 is actually quite extraordinary (+40%). Moreover, there have been transformative changes since 2008 in consumer patterns driven by technology and the near-ubiquity of mobile. Given these developments, now would be a good time to evaluate your integrated omnichannel capabilities and assess if they are fit-for-purpose. The following four trends are key focus areas for assessing strategic preparedness in the current economic climate. The CFPB report highlights that in 2018 alone, credit card debt grew by $36 billion, student loan debt by $79 billion, and auto loan debt by $53 billion. As you can see below, non-housing consumer debt balances have been on a sustained upward trajectory for the past eight years and show no sign of leveling off. 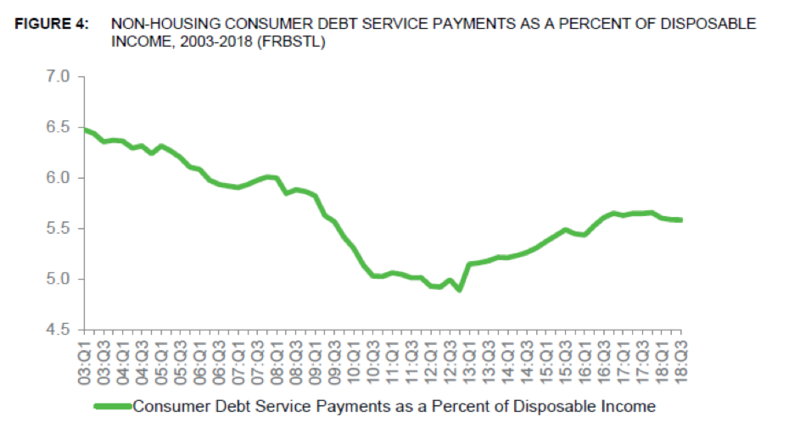 The CFPB report also highlights the consumer debt service ratio, measuring the cost consumers pay to service non-housing debt (i.e., payments due on outstanding loans) as a fraction of disposable personal income. While still below historical levels, it is now on a consistent rise since its Q1 2013 trough. In a rising rate environment 2020 and beyond, this ratio could move upward quickly, adding stress to the consumer. Add this to the fact that Americans are saving less, at a rate of 2.4%, the lowest since the debt-fueled rise of the mid-2000s. In fact, in a recent Federal Reserve survey, 35% of adults reported that a $400 emergency would mean they couldn’t pay their bills for the month. Part of the CFPB’s role is to provide resources and education to the public. One of their efforts in education is an interactive online tool called Ask CFPB. As part of Ask CFPB, five sample letters were provided that individuals can download and use. Since June of 2014, 74% of the downloaded letters relate to how agencies communicate with their debtors. The most popular letter is intended for consumers who need more information about a debt, and the second most popular is for consumers who want to dispute their debt. This points to a weakness in effective communications between debtor and agency. While the data in the following graph is sourced separate from the CFPB report, we think the erosion of telephony effectiveness remains a related critical factor for the industry. If you still rely primarily on telephone and letters to communicate with debtors, you need to consider complementary omnichannel alternatives as well as advanced analytic techniques such as machine learning to improve response and payment activity. Katabat sees this as a perfect example of how the industry must evolve in the ways in which it communicates with debtors, complementing traditional channels with newer omnichannel capabilities. Overall consumer lending is on the rise, perhaps too much. Second, while not limited to lending, people are changing how and when they communicate. As we’ve said before, consumers expect the same level of service from other providers as they do from Amazon. Yes, that includes their lenders. The topic of debt can be confusing. It requires clear and effective communication. When the economy does turn, the omnichannel capabilities of your debt collection software will become even more important. Assess your communication strategies and technologies now, before the financial stress that’s building becomes another recession. Then you will be ready to communicate effectively and collect efficiently when it matters most. Check out our top 5 ways you can prepare ahead of the next recession and this checklist to determine if your collections software is ready for a recession. Are you prepared to deliver a seamless omnichannel experience? If you are still struggling with implementing an effective digital collection solution, download our recent whitepaper to learn how to sidestep the top 3 challenges to quickly implement a digital solution that improves debt collections and accounnt recovery with a better customer experience.